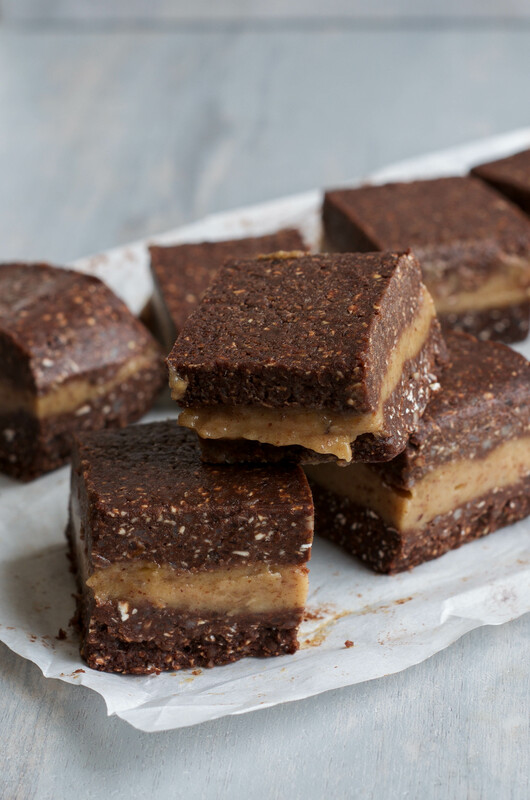 Rich, sweet, and definitely satisfying, this Raw Brownie Caramel Slice is such a treat ! 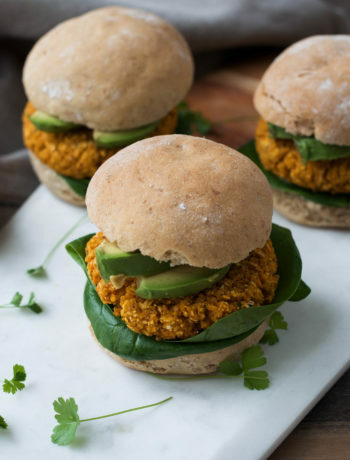 Easy and quick to prepare, you don’t even need an oven. What are you waiting for ? Raw Brownies have been popular for quite some time now. It’s definitely easy to understand why: easy to whip up, they usually require only a few ingredients but definitely do not lack in flavor. 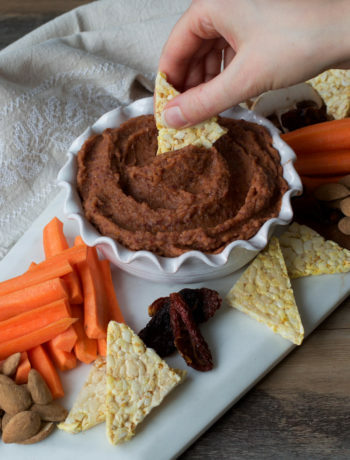 The key to this richness and amazing texture is definitely the dates and nuts. Your sweet tooth will easily be satisfied with one slice ! 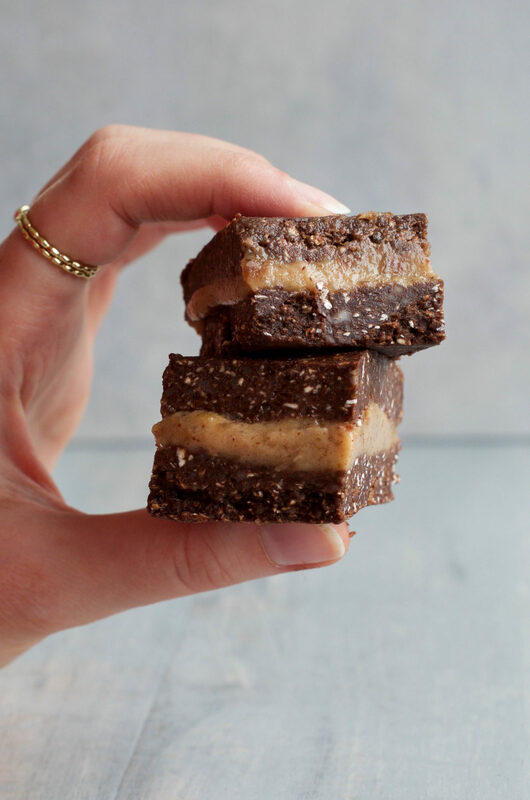 This Raw Brownie Caramel Slice combines my version of raw brownies, with the addition of a delicious date caramel filling. Talk about a decadent treat ! The caramel, sandwiched in two brownie slices, takes this dessert to the next level. 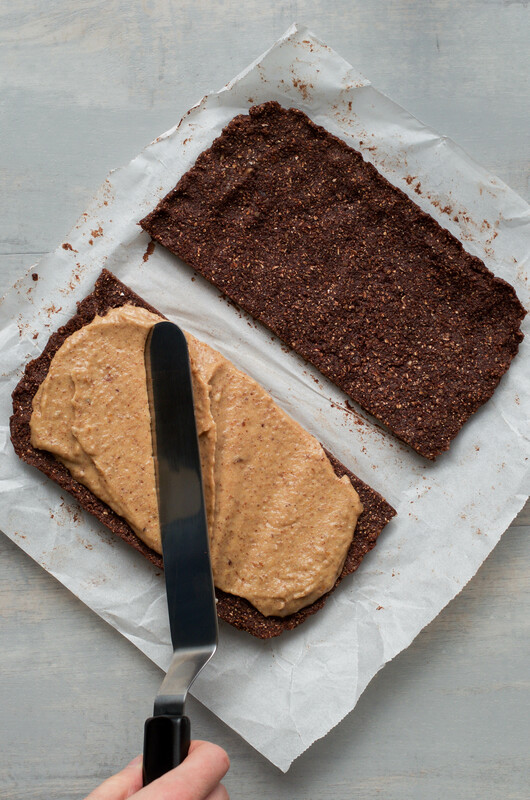 To make the brownie a bit “lighter” – even though it is definitely still rich – I replaced part of the nuts with oats. For a nice addition, I chose to use sunflower seeds as well. Rich in Vitamin E, just like almonds, they’re also especially rich in poly-unsaturated fatty acids, which we need in our diet. The sweetness in this recipe only comes from the dates. Sure, dates contain a lot of sugar, but they’re also a good source of fiber and minerals. Dates naturally have a slight caramel taste, which makes them perfect ingredients for this caramel ! 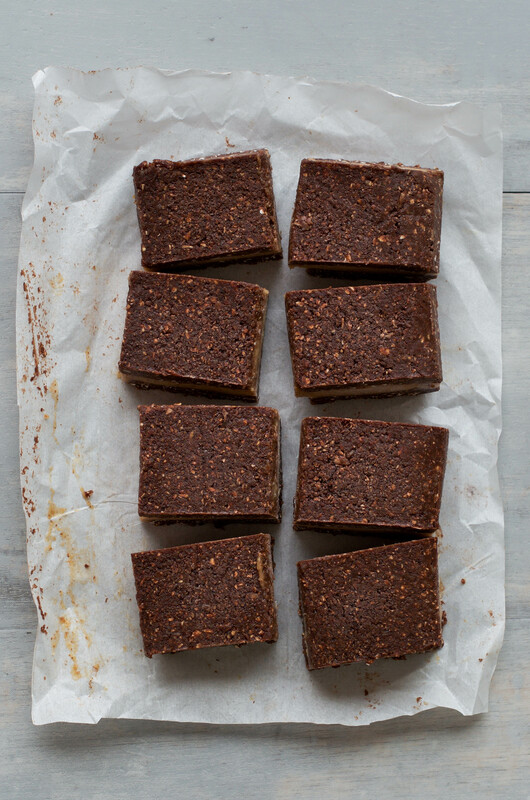 No oven needed, so easy to prepare with a food processor, the recipe for this Raw Brownie Caramel Slice is a winner. Go ahead and treat yourself ! As you can see on the pictures, I used blanched almonds. This is only because, for some reason, they were the only kind I could find in the store. I usually go for unblanched almonds, so feel free to use these in this recipe. If you have a nut allergy, you can easily replace the almonds with your favorite kind of seeds. Same goes for the almond butter, replace it with sunflower seed butter for example. This will affect the taste, but the brownies will be delicious nonetheless. If you are using medjool dates or soft dates, you probably don’t need to soak them. However, if your dates are a bit dry, soak them in hot water for 15 minutes so they soften and blend easier. Don’t discard the water in which they soaked ! You can use some of it in the recipe, when it calls for water. Let's start by making the brownie. If your dates aren't very soft, soak them in hot water for 15 minutes. In the meantime, line a 20 cm x 20 cm freezer safe dish with parchment paper. 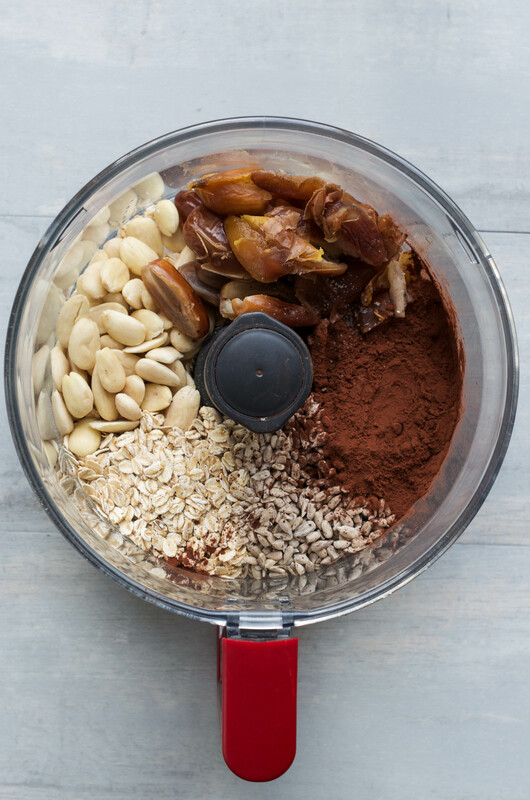 Place the dates (drained), oats, almonds, sunflower seeds, cacao, and pinch of sea salt in a food processor. Pulse until crumbly. Add the tablespoon of water and process for a couple of minutes until it forms a sticky ball of dough. You may need to scrape the sides of your food processor a couple of times. If it is still too crumbly, or doesn't stick well together, add a little bit more water, 1tbsp at a time, until the dough is formed. Press the dough evenly into the dish. Place it to set in the freezer for at least 1 hour. Onto the Caramel. If your dates aren't very soft, start by soaking them in hot water for 15 minutes. Add the dates (drained), the almond butter, pinch of salt, and 1 tablespoon of water into your food processor. Process until very smooth. After one hour, take out the brownie from the freezer. Cut it in half, so you get two equal size brownies. Spread the caramel on one, top it with the other brownie (kind of like a sandwich). Put the brownie into the freezer to set for 30 minutes to 1 hour. Once the caramel brownie is set, cut it into squares and enjoy ! 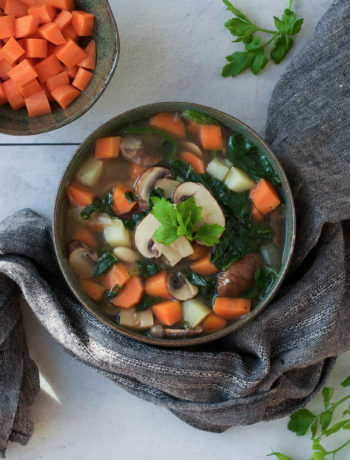 You can store it in the fridge or the freezer. If you keep it in the freezer, take it out 15 to 20 minutes before enjoying it so it has the perfect texture. * If you're soaking your dates in water, definitely use the water for this. You may have a little bit of date caramel leftover: use it as a topping for porridge, or in a chia pudding parfait for example.